Shrink sleeving is similar to shrink wrapping except its use is more decorative. 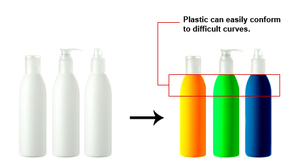 Plastic may be used to package twist bottle tops, label sleeves can also cover the main body or even an entire product. The unique conforming quality of shrink sleeves makes it possible to package the most physically challenging products. What are the advantages of shrink sleeving packaging? Shrink sleeving can be used for several product shapes and sizes that would be otherwise challenging to package using other methods. Can showcase artwork in several colors, finishes and effects. Ideal for visually enhancing designs. We can produce and supply shrink sleeves in rolls. We can print, produce and supply shrink sleeves in pre-forms. We can use custom labels, artwork and other material. We have the capacity to shrink sleeve 50,000 pieces per day. We stock clear shrink sleeves in sizes 12mm to 270mm LF (lay flat width). We can immediately shrink sleeve sizes up to a typical-size gallon bottle or accommodate up to 3 feet by 4 feet (roughly 915-1220 mm) in any length. We will provide an initial mockup/prototype for any service where applicable.